Cosmos-Maya, a production house which has for long been pushing the boundaries of quality and aesthetics with its animated content is now going a step even further. 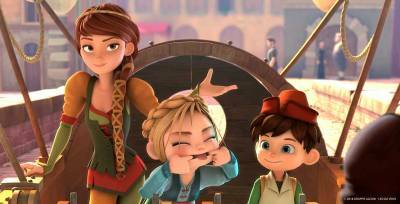 Their next venture is another high quality 3D animation international co-production - a spin-off series based on the recently released film Leo da Vinci: Mission Mona Lisa. Leo da Vinci: Mission Mona Lisa, a film produced by Gruppo Alcuni was screened at the Cannes Film Festival lately. This is another great achievement for the film which premièred in Italy in January. Gruppo Alcuni is one of the leading companies in the Italian and European animation production sector. To date their series and the feature films have been distributed in over 137 countries worldwide. After capturing hearts in Italy, the film released last month in the cinemas of Russia CIS and South Korea respectively and will release in China next month. Taking this success forward, the Italy based Rai Ragazzi and Gruppo Alcuni and Singapore & India based Cosmos-Maya have come together to co-produce the spin-off, Leo da Vinci, a children’s cartoon series which will air on Rai TV. The series looks to capitalize on the popularity of the movie as well as the admiration of the national icon. The series will have 52 episodes of 13 minutes each. This is Cosmos-Maya’s second association with Rai TV, the biggest Italian public broadcaster. Leo, a 15 year old version of Leonardo da Vinci is the protagonist of the show. His curiosity and will to learn enable him to keep inventing new and unique machines. These he uses to have fun with his friends, Lisa and Lorenzo. He also uses these inventions to keep evil at bay. Blue Pirate, assisted by henchmen Francis and Cicala, provides the villainy aspect to the show. Cosmos-Maya has stayed ahead of the curve by striving to enhance the quality of animation with each new project it undertakes. Leo da Vinci is a testament to the company’s superior prowess in the field of high quality animation.